In England’s heartland metropolis, more than 1,200 Scientologists and guests gather on Saturday, October 21, to toast their victory with the opening of the Church of Scientology Birmingham. Mr. Miscavige’s presence in the heart of the “City of a Thousand Trades,” October 21, signifies the import of the day, as he dedicates the new Church of Scientology Birmingham. Mr. Miscavige delivers his dedication address to an expansive crowd gathered at the festive grand opening ceremony, held Saturday, October 21, in Birmingham. 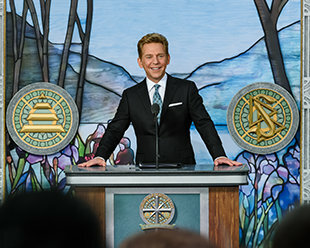 Scientologists that were at the vanguard of making this remarkable day possible, join Mr. Miscavige on stage to inaugurate the opening of a grand new Scientology Church. More than 1,200 Scientologists gather on six acres of historic grounds in the Ward of Moseley, to share in the opening of the Church of Scientology of Birmingham. The festive affair marked a celebration of the “Brummie” spirit of innovation, industry and cultural prominence. A thunderous roar rises from the crowd as the ribbon falls, marking a new age for Scientologists of the Midlands. In the home of metal, the grand opening kicks off with a rendition of the rock classic “We Built This City” in honour of Birmingham as the hotbed of industrial Britain. Mr. David Miscavige with (left to right): Ms. Decima Francis MBE, Founder, From Boyhood to Manhood Foundation; Ms. Diana Coad, National Drug Prevention Alliance representative; Dr. Paul Baiden-Adams, Multi-Cultural Support Aid Services, UK; and Mr. Yann Lovelock BEM, Senior Advisor for the Birmingham Council of Faiths. Delighted attendees pour through the facility, exploring every eye-catching aspect of their prominent new home in the heartland of the Midlands. Guests take in the stunning surrounds of the new Church of Scientology Birmingham. The new Church of Scientology Birmingham was built in 1930 and stands on a six-acre estate in the cosmopolitan ward of Moseley. The facility is recognised as a heritage site of value by Historic England and is now faithfully restored, including its traditional Birmingham red brick, Portland stone facings, oak doors and exquisite British marble. Altogether, the 45,000-square-foot facility now stands ready to serve communities across the Midlands. RECEPTIONOpen seven days a week, morning to night, the Church of Scientology of Birmingham Reception welcomes anyone wishing to obtain an introduction to Dianetics and Scientology. SCIENTOLOGY PUBLIC INFORMATION CENTREThe Public Information Centre offers some 500 films, providing a complete introduction to every aspect of Dianetics and Scientology. It includes the beliefs and practices of the religion, a biographical presentation on the life and legacy of Founder, L. Ron Hubbard, as well as the many humanitarian initiatives and community outreach programs the Church supports. INTRODUCTORY SERVICESThe Church of Scientology Birmingham provides for the delivery of all Introductory Services. These include an entire array of Scientology Life Improvement Courses to help better any aspect of one’s life. DIANETICS & SCIENTOLOGY BOOKSTOREThe Church of Scientology Birmingham Bookstore makes available L. Ron Hubbard’s works on Dianetics and Scientology. In all, Mr. Hubbard’s legacy comprises tens of millions of published words in dozens of books and thousands of recorded lectures. Materials are available in 50 languages. THE PURIFICATION CENTREScientology Founder L. Ron Hubbard developed the Purification Program to free individuals from the mental and spiritual damage caused by drugs and toxins, through a regimen of exercise, sauna and nutrition—all of which are provided for in the Purification Centre. The mural depicts the canals that were the lifeblood of Birmingham at the dawn of the Industrial Age. HUBBARD GUIDANCE CENTREThe Hubbard Guidance Centre is where Scientologists receive one-on-one spiritual counselling, known as auditing. Just beyond the waiting room are dozens of auditing rooms. Each of Birmingham’s auditing rooms is ideally appointed to provide the calm, distraction-free setting requisite to achieving spiritual enlightenment. THE ACADEMYThe Academy is where Scientologists train to become auditors (spiritual counsellors), capable of applying the technology of auditing to help others attain spiritual freedom. The Birmingham Academy comprises multiple course rooms, each devoted to a different aspect of training. THE CAFÉThe Café welcomes visitors touring the Church and provides a gathering place for those attending the many scheduled events. It is further provided for parishioners during breaks in their Scientology services. THE CHAPELThe Chapel, lined with the Codes and Creed of the Church of Scientology, provides for all congregational ceremonies and services—including Sunday Services, Weddings and Naming Ceremonies. The Chapel also serves as an ideal venue for workshops, banquets and events, in the name of community collaboration for the betterment of Birmingham. THE OFFICE OF L. RON HUBBARD As is tradition in all Churches of Scientology, the Office of L. Ron Hubbard stands in honour of the religion’s Founder and symbolises that this Church is true to his writings and ideals. THE PITMASTON HOUSEThe site of the refined neoclassical estate on Moor Green Lane was originally home to the family of Sir John Charles Holder, a Justice of the Peace and High Sheriff of Worcestershire. In recognition of its heritage and architectural significance, the building was listed in 2003 as a place of special historical interest. Every historic piece has now been faithfully restored from the intricate window leading, brass fretwork, honey alabaster and oak wood finish. Around the world, even people who don’t intimately know Birmingham have fallen in love with so much that has sprung from this heartland metropolis of Britain. From artists to industry, airplanes to Shakespeare and even street lamps—Birmingham has lit the way both industrially and culturally for hundreds of years. In this city very much proud of its past—which still continues to grow, to re-invent and to prosper—a grand opening celebration was held in the collaborative spirit of a prosperous future. Or rather, it was a day that represented the essence of “Brum’s” bold motto: Forward. Birmingham continues to be a leader in manufacturing and industry, and the grand opening celebrated the “Brummie” spirit of innovation, all to the rhythm of the city’s electric beat. At the forefront was an ode to Birmingham’s iconic metal roots, backed by a band of dignitaries speaking of treasured landmarks returned to the community, and dreams realized thanks to Scientology Founder L. Ron Hubbard’s tools for life. In alignment with that spirit of partnership, and following on from so many cities that have opened their doors to new Churches of Scientology, Birmingham is far from an overnight success story. In fact, the Church has worked hand-in-hand with community groups and volunteers in the area for more than two decades, connecting with individuals and groups on literacy programs, drug-prevention initiatives, human rights awareness and morals education. In point of fact, and over the past 12 months, local volunteers and parishioners have helped distribute thousands of The Truth About Drugs booklets, bringing the total to more than 140,000 individuals reached since the Church first started working in the area. Thousands more have received education in universal morals through distribution of L. Ron Hubbard’s The Way to Happiness, as well as copies of the United Nations Declaration of Human Rights. Thus, the Grand Opening of the Church’s new facility will only serve to extend an expansive humanitarian outreach. The new Church of Scientology Birmingham facility was built in 1930 and stands on a six-acre estate in the cosmopolitan ward of Moseley. The facility is recognized as a heritage site of value by Historic England and is now faithfully restored, including its traditional Birmingham red brick, Portland stone facings, oak doors and exquisite British marble. Altogether, the 45,000-square-foot facility now stands ready to serve communities across the Midlands. Bringing that commitment to light, the Scientologists and guests in attendance were joined by prominent dignitaries to welcome the new facility. They included: Mr. Yann Lovelock BEM, Senior Advisor for the Birmingham Council of Faiths; Dr. Paul Baiden-Adams, Director of Multi-Cultural Support Aid Services, UK; Ms. Diana Coad, National Drug Prevention Alliance Representative; and Ms. Decima Francis MBE, Founder, From Boyhood to Manhood Foundation. The new Church provides visitors with an introduction to Dianetics and Scientology, beginning with the Public Information Centre. Its displays, containing more than 500 films, present the beliefs and practices of the Scientology religion and the life and legacy of Founder L. Ron Hubbard. The Information Centre also details the many humanitarian programs that Scientology supports. They include a worldwide human rights education initiative; a far-reaching drug education, prevention and rehabilitation program; a global network of literacy and learning centres, and the Scientology Volunteer Minister program, which has become the world’s largest independent relief force. The Birmingham Chapel provides for Scientology congregational gatherings that include Sunday Services, Weddings and Naming Ceremonies. It will also host community-wide events, open to members of all denominations. The facility further includes multiple seminar rooms and classrooms, and an entire wing dedicated to Scientology auditing (spiritual counselling). The opening of the new Church of Scientology Birmingham comes during a period of rapid expansion for the religion with 60 new Churches of Scientology from Los Angeles to Tampa, London to Milan, Johannesburg to Tokyo and Tel Aviv to Kaohsiung. Over the past decade, those openings have driven worldwide expansion for the religion to a rate surpassing the previous 50 years combined. In 2017, openings of new Churches of Scientology have taken place in Auckland, New Zealand; the San Fernando Valley, California; Miami, Florida; Copenhagen, Denmark; and just last week in Dublin, Ireland. More Church openings are planned in the next 12 months for cultural epicentres in Europe, Latin America, North America and Africa.